Fishing at Pemberley in P&P: Vital Plot Device or Unimportant Side Point? 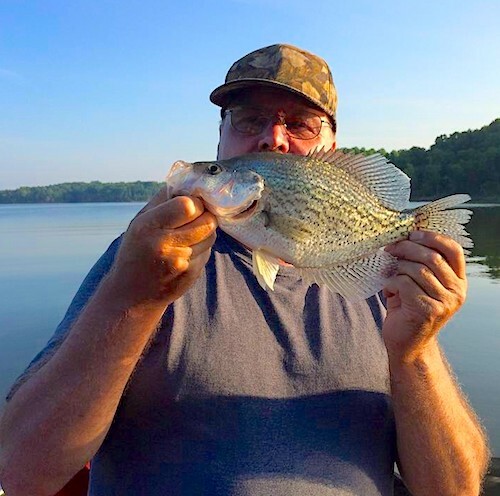 Steve holding MY big catch of 2015, a 14″ slab crappie! It was DELICIOUS! Lakes and rivers are plentiful in Kentucky, thanks to the plentiful rain. I don’t think the moving van was out of sight before my husband announced his desire to buy a fishing boat. I suspect I rolled my eyes, as I did the subsequent two or three dozen times he broached the topic. Unlike me, he grew up fishing. My only vivid memory of fishing as a youth involved severely choking on a trout bone, which led to a decades-long aversion to anything with scales and bulgy eyes unless in an aquarium tank. After our first winter in Kentucky, as the leaves returned and the flowers bloomed, the draw of tranquil lakes and diverse wildlife overcame my reluctance. After a couple of boat rental trials, we began our search for a fishing boat of our own. 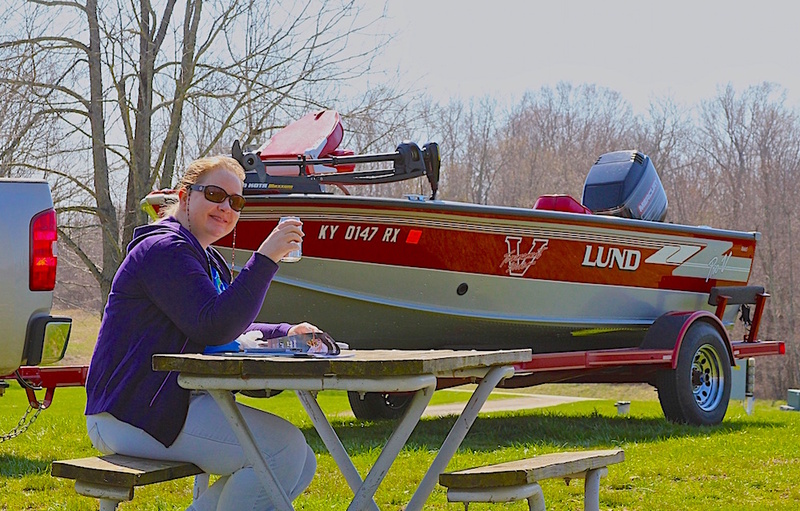 Finally, in August of 2014, we purchased a Lund (red, as my husband desired) and after a stumbling fall season as a novice angler, I discovered a new passion within me: FISHING! Yes, I am “hooked” on the sport of fishing. LOL! There’s a remaining tendency to roll my eyes at the plethora of angling experts with their endless tips on how to entice fish — as if the creatures are as smart as Einstein — and the fishing-dedicated rows upon rows at Cabela’s will forever boggle my mind. Nevertheless, having experienced the results, I can greater appreciate some of the science behind catching fish. Having a picnic lunch before we hit the lake in our awesome Lund. 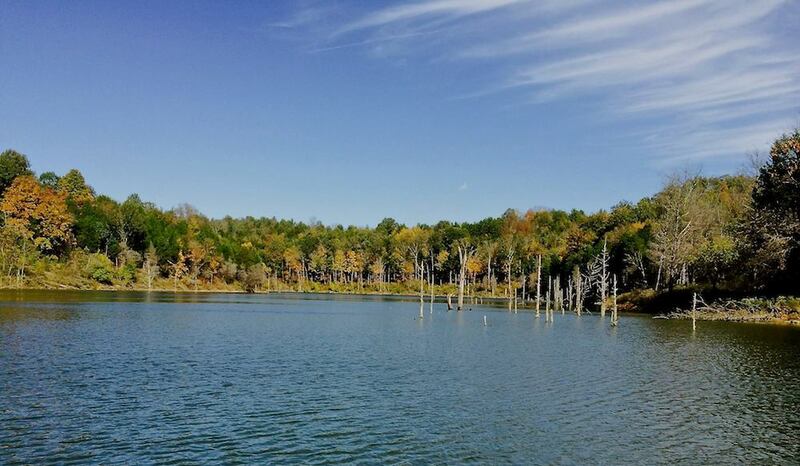 A cove on Taylorsville Lake in Kentucky, October 2014. Most importantly, my passion for fishing, with the accompanying comprehension of how fishermen think, revealed to me the deeper implications of the sport’s use in Pride and Prejudice. It is these subtle but profound messages I wish to talk about today. As I discovered, other than Mr. Gardiner and Mr. Darcy, the only other character linked to fishing in all of Austen’s novels is Captain Harville in Persuasion, and the naval officer is merely noted as keeping a net. On the face of it, this lack of fishing references could translate to the sport being unimportant to Jane. Or, perhaps the rarity is a message for the reader to take note! I submit that in Pride and Prejudice, Austen’s choice of fishing for the backdrop of interaction between the two gentlemen is not a random option but a specific, thoughtful inclusion. The “fishing scene” takes place in Chapter 43. Lizzy and her aunt and uncle are walking the grounds after their tour of the house, the first mention of fishing occurring minutes before unexpectedly encountering Mr. Darcy.
. . . they took their way towards the house on the opposite side of the river, in the nearest direction; but their progress was slow, for Mr. Gardiner, though seldom able to indulge the taste, was very fond of fishing, and was so much engaged in watching the occasional appearance of some trout in the water, and talking to the man about them, that he advanced but little. Mere minutes later is the surprise encounter with Mr. Darcy. After Lizzy and Darcy’s short exchange of uncomfortable greetings, Lizzy introduces him to the Gardiners. A conversation ensues, but there is no hint as to what the topics of discussion are or how long the quartet stands on the pathway chatting. The first, and in fact the only specific subject noted at this juncture is fishing. Now, follow along as I dissect and decipher these sentences, few in number but profound in meaning. First, Mr. Gardiner’s reaction to seeing fish in the water and Austen’s “very fond of fishing” phrase establish his passion for the sport. He may not have time to “indulge the taste” but his desire is so intense that his attention is immediately and wholly riveted upon the water. Speaking as a fisherwoman, I know exactly what this feels like! I can guarantee that how I look at a body of water now compared to before I developed my love of the sport is wholly different. And if I see fish swimming or jumping, I itch to grab a pole. Watch out koi in the placid Japanese lily pond! LOL! Austen writes “with the greatest civility” in describing how Darcy invites Mr. Gardiner. At face value, this can be interpreted simply as meaning his words were polite or that his tone was kind and respectful. The clue to a broader, noteworthy interpretation is in the specific details that follow. You see, a serious fisherman — and I submit that Austen is claiming this about Mr. Darcy — is highly secretive, especially regarding one’s own property and prime fishing spots. Austen’s careful selection of words makes it clear that Mr. Darcy had ready access to “fishing tackle” and knew precisely where the best fish were located. This is hugely significant. It not only reveals Darcy’s skill in the sport–which can only come after years of practice–but most importantly, his willingness to share his knowledge with a virtual stranger. It may seem that Mr. Gardiner’s comment is implying arrogance, fickleness, or superiority on Darcy’s part. Not so. In actuality, Mr. Gardiner is expressing a logic that anyone slightly familiar with an angler’s attitude would instantly understand. As I said, fishermen are a secretive breed on the whole. They do not easily or readily share their knowledge, especially when it comes to catching fish from one’s private stock and depleting the count. IF Darcy is an avid fisherman, as I believe he is, this would not be a comfortable offer to make, and under any other circumstance it probably never would have entered his mind to do so. Which leads me to point number two. The second half of the quoted paragraph above shifts the point-of-view to Lizzy and Mrs. Gardiner. The latter wears a “look expressive of her wonder” and the internal musings of Lizzy note her “astonishment.” At first glance, their reactions could be interpreted as being surprised about Mr. Darcy’s generosity and kindness in a general sense. Akin to what I said in regards to the “greatest civility” comment, but again, that is not the deeper meaning. Darcy recognized Mr. Gardiner as a kindred spirit, I believe. Naturally, he was seeking ways to ingratiate himself to Elizabeth, so might well have leaped at any chance to do so! And indeed, Lizzy was astonished by his pleasant interaction with her relatives overall, as this is noted several times in the chapters recounting their time at Pemberley. Yet again, there is a deeper meaning and purpose to this incident, Austen not choosing the recreation of fishing willy-nilly for Mr. Darcy. We know that Mr. Darcy hunted, as most gentlemen did, yet he is the only Austen hero who is specifically noted as a fisherman. The quote from Mr. Deuchar so perfectly fits the personality of Mr. Darcy, and anyone who has ever tried to fish or been around fishermen knows this truth. Can you begin to imagine how this revelation would affect Elizabeth? The timing of this scene is significant. Remember, just prior to this juncture in the novel, Lizzy expressed her awe of the natural beauty of Pemberley’s grounds. Austen is elaborate in her descriptions of the terrain, as seen through our heroine’s eyes, and the reader is well aware by this time of Lizzy’s delight in the outdoors and solitude. Next, she listened to Mrs. Reynolds praise her master’s fine qualities at some length, unveiling a humble, warm, solicitous side of him hitherto unseen by Lizzy. Lastly and critically, of all the places she could have accidentally encountered Mr. Darcy, it is while walking across the extensive lawn near the river! She already knows he is a passionate horseman and that he loves his country estate. What a vivid reminder of their mutual attraction to the outdoors! Augmenting these realities and the accompanying sentiments, envisioning him fishing must have been an emotional image. Far more than many women, Lizzy would comprehend the nuances in his invitation to Mr. Gardiner. Getting back to the “Why would he do that?” question in perspective #1, both women know exactly why the invitation was extended. Lizzy’s internal questions from the text are rhetorical, even if she isn’t quite ready at this stage to believe the answers. Darcy is an intelligent man, and he knows of Lizzy’s affinity for nature. What better way to send a message of his continued regard then to invite her uncle to fish? Best of all, what better way to cleverly and carefully pick Mr. Gardiner’s brain about the woman he loves then while in serene companionship by a placid, soothing river? I bet Darcy was silently thanking the heavens (or Miss Austen) for presenting the opportunity. Oh yeah! Darcy may have been caught unawares by Lizzy’s abrupt appearance on his doorstep, but once he “collected himself,” his mission to extend their time together AND make every second count was grabbed tightly. Good job, Darcy!